There are many ways to utilize the A&E Literacy Project. The A&E products can be used in conjunction with each other, in conjunction with other projects, or individually. The A&E Literacy Project can also be used as a fund-raiser. Please view the A&E Literacy Project Presentation below. Andy & Elmer’s Apple Dumpling Adventure is the story of a young entrepreneur who starts an apple dumpling business. With the guidance of a mysterious voice, conveying the Four-Way Test, he turns his venture into a wonderful success and makes friends along the way. The story was written and illustrated by Andrew J. Shoup, a local children’s book author and illustrator. And the book is jointly published by the Rotary Club of Fairborn and TokoBooks. Please view the Video Presentation of the story below. The A&E Hardbound & Paperback Picture Books are beautifully illustrated and, in addition to the story, there is information about Rotary and a special Apple Dumpling Recipe in the back. The recipe can actually become a fun project with parents or, as some schools have done, can become a classroom project involving skills in reading, math, following directions, and teamwork. Some schools have gone even further by selling apple dumplings as a fund-raiser. The A&E Coloring & Activity Book contains pretty much the same story as the Hardbound Picture Book, although it has been somewhat abbreviated to fit the coloring book format. In addition to the coloring pages and story, there are several activities in the back of the book, including a crossword puzzle, word search, and drawing exercise. It also contains information about Rotary. It works great in conjunction with the A&E Hardbound Picture Book or as a follow-up to it. But it can also stand alone. 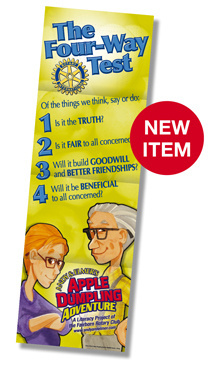 The A&E Four-Way Test Bookmark is a fun, colorful piece which conveys the Four-Way Test and includes characters from the story. Many clubs that are currently involved in the Dictionary Project will utilize the A&E Bookmark by simply putting one into each dictionary as they hand them out to children. The A&E Four-Way Test Poster is a fun, colorful piece which conveys the Four-Way Test and includes characters from the story. Perfect for the classroom, library, or even a child's bedroom. These items can be used any number of ways to create an exciting literacy project for your club. They can even be used as a fund-raiser.